I was told that the man in uniform seated on the horse was my grandfather, Charles. He used to enjoy showing off his injured toe, which he said was crushed by a horse. Maybe this photograph is the proof of the story… or not? 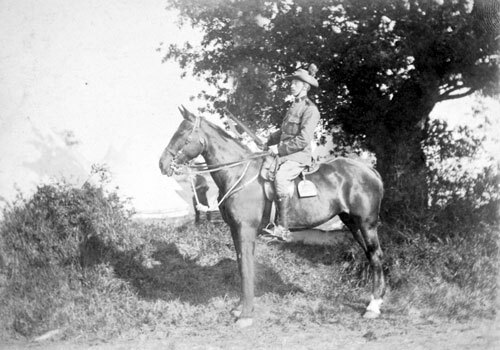 It is odd to see him in uniform on a horse as he was rejected by the army in the First World War. They said that he had a ‘weak chest’ and would not live long. Ironically, he lived a very long and healthy life, unlike so many of his contemporaries, and died just a few months short of his 100th birthday!